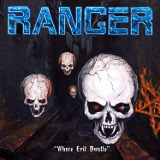 Now that my neck has sort of recovered from listening to Ranger's Finnish first-time speed metal LP, I think I can competently review it. Maybe. Simultaneously as retro and vicious as a double-bladed battle-axe to the face, Where Evil Dwells is energetic enough to make a corpse smash out of its coffin and start headbanging in front of horrified onlookers. The high-speed guitar riffing is nonstop, the rough but clean vocals are repeatedly punctuated by high-pitched screams, and the lyrics are a jumbled mix of Satanism and both nuclear and conventional warfare. For 80s metal lovers like me, it's a confection. Defcon 1 is pretty characteristic of what one gets throughout the album. A twin-guitar attack of heavily overdriven riffing, combined with a coldly overdriven lead, provides the intro for a thrashing rhythm combined with Dimi Pontiac's ridiculously over-the-top vocals, which give not only modern thrash singers but even 80s-era shriekers a run for their money in the helium-fueled scream department. King Diamond (nowadays), or Warrell Dane circa 1989, could outscream this guy, but not by much. The guitar solos match the breakneck speed of the rhythm, their tone given real beauty by the production on songs such as Dead Zone or (a favorite of mine) Phantom Soldier, which sacrifices none of their furious power but is, of course, far superior sound-wise to what was getting achieved on most 80s metal records. I also enjoyed Black Circle (S.Y.L.S. ), a delightfully cheesy piece that switches from a smooth-running rhythm halfway through to a galloping one with an even faster speed, all to Pontiac chanting "say you love Satan!". The title track is as long as two songs put together, so I was a bit nervous that a band like this, which thrives on speed and whose songs are typically short, wouldn't be able to pull this off, but in fact they easily do it justice, by the simple expedient of filling all the extra time not taken up by extra riffs with shredding, a practice that is bound to make for some appreciative listeners. The last song, Storm of Power, was the only one I didn't like quite as much, not because of the music, which is as crushing as ever, but because it's a song about how metal they are, which according to some unwritten rule of 80s speed metal, is a mandatory track on any album, regardless of how dumb it sounds 30 years later. They even rhyme "fools" and "rules", which I had hoped would become a thing of the past after MTV stopped headlining Poison. Oh well; perhaps they can't help but bring in some of the bad out of the past with the good. Where Evil Dwells isn't quite in masterpiece territory, but it's excellent for a first LP. Forget about progressive musings or post-metal nature worship here; this album is pure sleazy, leather-and-spike-clad fun that packs a ton of explosive energy into 39 minutes of listening, all the while offering the distinct possibility of snapping one's spinal cord.